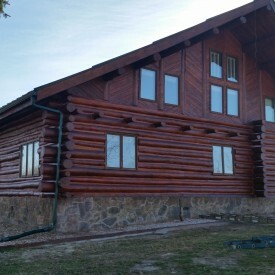 Log home owners want to know how to check for rot on their log cabin or home. It’s an important part of the annual maintenance check-up. Sometimes logs look solid but it’s not until you physically tap on them that you discover you have a problem with rot. Below is a short video that provides an example of the difference in tone between a solid log and one that has been hollowed by log rot. 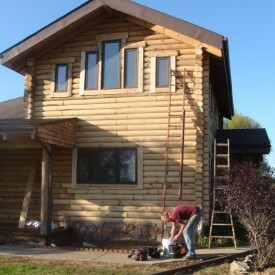 This type of inspection process may require you getting out the ladder in order to tap on logs that are out of reach from the ground. If your home has crowns (log ends) that are not well protected by the roof overhang, it’s a good idea to check the top sides of them every year. That is a classic place for logs to rot since they are so exposed to the elements. Essentially, exposures to the elements leave your logs vulnerable to damage by water and wood destroying insects. So, what if you DO find rot? Then what? You have a few options for repair. 1) If only a few logs are affected, they may be replaced by cutting out the logs and inserting new ones. This procedure, however, is not as straightforward as it seems due to the interacting of the logs. 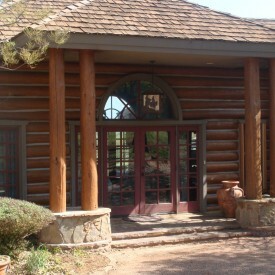 2) Another repair procedure is to treat the decayed logs with an epoxy or petrifying compound. The timbers are injected with a compound that stops the rot and solidifies the decayed wood sections. 3) The most radical treatment would be to shore up the roof and rebuild the walls. This alternative is however the least cost effective but offers the best structure longevity. 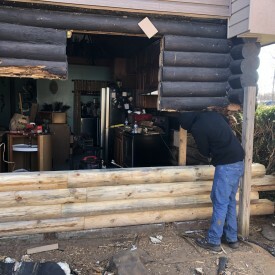 If you do in-fact have log rot, we recommend calling in an expert to help determine the extent of the damage and the best course of action to resolve it and insure any contributing factors are addressed.